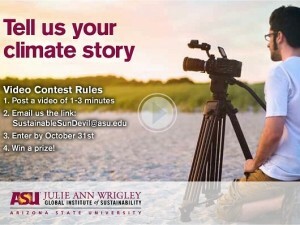 In recognition of Global Climate Change Week during Campus Sustainability Month, the ASU Wrigley Institute has launched the Climate Story Video Contest. The contest invites ASU students to examine how the changing climate has affected their lives and how they feel about it in a video of three minutes or less. Contest winners will be determined through both a popular vote - or the number of likes a story gets on the ASU Wrigley Institute’s YouTube Channel - and a judges vote. The winning videos will be featured on the Walton Sustainability Solutions Initiatives and Imagination and Climate Futures Initiative websites in addition to the ASU Wrigley Institute's, as well as shown during the Sustainability Festival in February 2016. Submissions are due by October 31, 2015. For information on how to submit your climate story, click here.